The Hatteras Bay extra large industrial kitchen pendant in olde bronze, part of an industrial style designer kitchen lighting range finished in olde bronze or antique copper, supplied by Elstead Lighting and designed by Kichler. Superb quality large kitchen pendant, suspended from a circular 127mm olde bronze ceiling mount by a central drop rod. 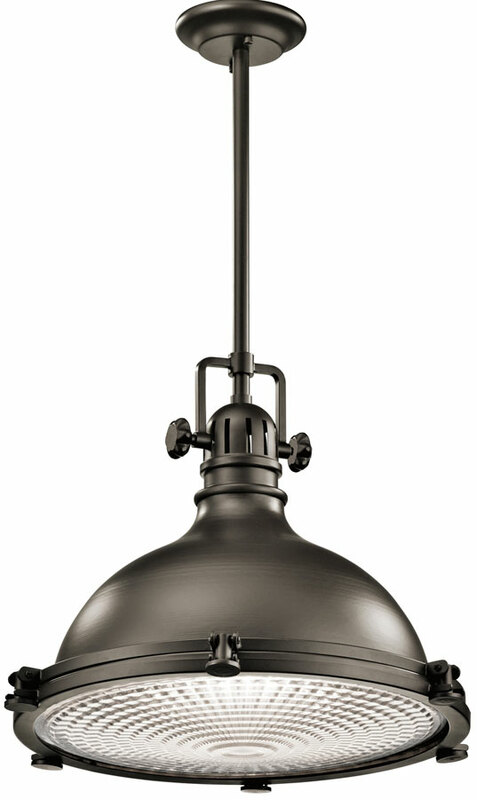 The extra large 60cm industrial style bell shade is finished in olde bronze and features top ventilation slots and two knurled adjuster screws. The prismatic glass lower lens is secured by a hinged retaining ring attached using knurled thumb screws.